I have wanted a Weber for a couple of years now. I have very fond memories of incredibly moist, flavoursome roasts with family friends who truly mastered the art of the Weber. They would even bake desert in the Weber, I remember some incredible upside down cakes. Anyway, I have a very small apartment with a very small balcony, so I couldn’t have anything too wide, but the baby Weber wouldn’t even have enough room to roast a chicken. Imagine my joy, when I saw the Weber smoker that is tall enough to roast anything I would like, not too deep for my confined abode, AND I’D BE ABLE TO SMOKE ANYTHING I LIKED!!!!!!!!! Imagine, I could make my own bacon! 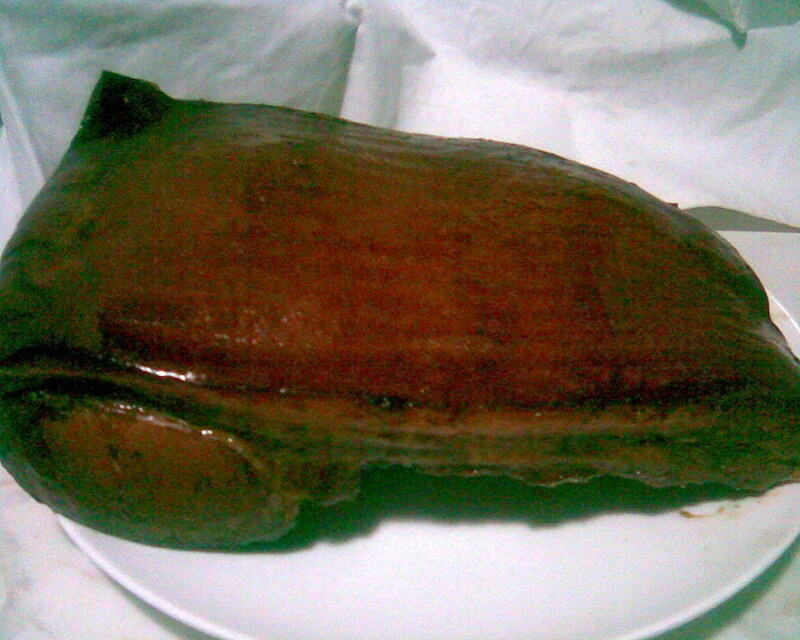 I lay-byed the fabulous elongated orb that looks like a black R2-D2, and dreamed and drooled about homemade bacon. Last week I purchased a middle of free range pork from my favourite supplier at the farmers market and dry-cured it in rock salt, molasses and brown sugar. With the pork curing slowly in the fridge, we picked up the smoker before work on Friday morning. I WAS SO EXCITED! Today, I have spent the day setting up the smoker, and the bacon is smoking away nicely in thick hickory smoke. It’s amazing the changes that can be induced in a single product, first turning a piece of pork into dry cured meat, then turning cured meat into bacon. If you can find a ziplock bag large enough to hold the pork, use a zip lock bag for this process. If not, chose a ceramic or plastic receptacle large enough to hold the pork (I used a ceramic baking dish). Spread the pork with molasses. Scatter half the salt and brown sugar on the bottom of your receptacle. Lay the pork on top and press into the salt. Lay the remaining salt and sugar on top of the pork. Cover and refrigerate for a week. Turn the meat after a few days to ensure the pork cures evenly. 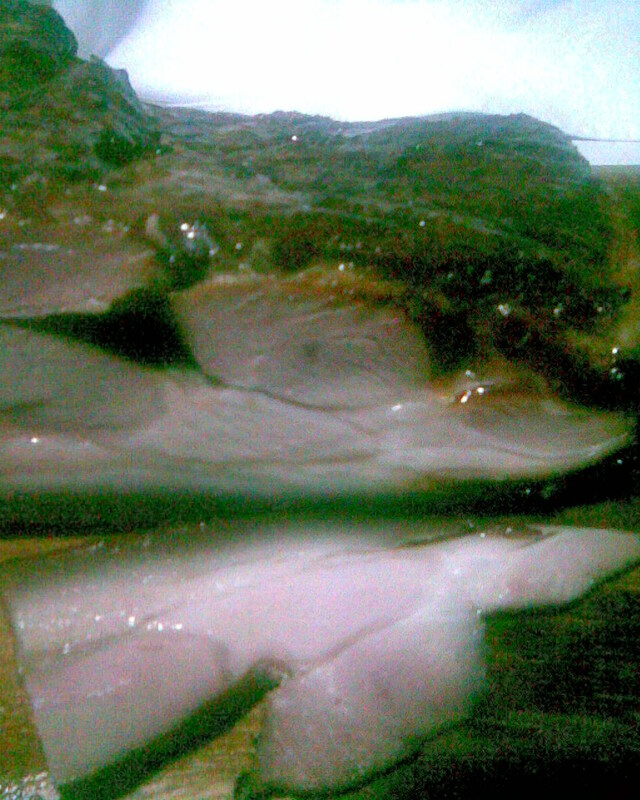 When you are ready to smoke the pork, remove from the fridge and rinse thoroughly. Follow the instructions of your smoker to light coals and heat the smoker. Smoke the pork for 3-4 hours with hickory wood chips at 100-120oC. Cool. Slice and enjoy! This entry was posted in Produce, Thoughts and tagged pork, smoked. Bookmark the permalink. 12 Responses to Makin’ bacon, baby! Found your blog from your comment over on Whole Larder Love about his workshop plan. I’m so impressed and inspired to read of your home cured bacon, it’s something I’ve always wanted to do and had no idea how simple it was. Thanks!! I’m glad you found me. How great is Rohan’s blog! It’s great to hear I’ve inspired you! You should totally give the bacon a go. I have a new supplier now, BoxGum Grazing at the Capital Region Farmers Market. Their pork is of an incredibly high standard, and free-range of course. I order it a week or two in advance. Hi Evane! I ❤ Boxgum Grazing. 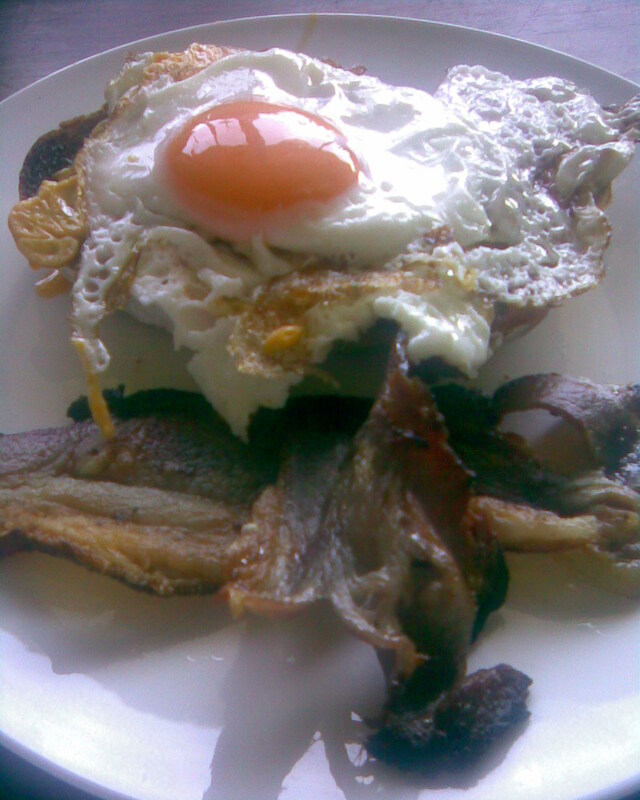 I'm going to start experimenting with a honey cured bacon too, i that's of interest to you. Indeeed, I used normal Saxa rock salt for my last batch and it turned out great. Do you know how to get smoke in your oven? I'd have no idea how that would work. That's the important thing to get from that stage. There are some online instructions abot how to make a smoker from a wok (or similar) on your stovetop. You might have more luckwith that or an electric frying pan. Honey cured bacon sounds lovely as I try to avoid sugar these days. I wouldn’t be able to get smoke in my oven without setting off the fire alarms so it wouldn’t be as delicious but at least I’d have bacon without the nitrites. Hmmm might try the wok smoking thing though – I have a portable stove so I can do that outside! If you’d like, we can arrange to smoke it in my smoker next time I light it. I’ve got some more pork coming to market next weekend, so I’ll start curing then and light the smoker two weeks later. I had also been thinking about trying to get a little business set up doing it. Would you be interested in buying it? What a fabulous business idea! There’s probably a whole bunch of people in Canberra who’d be interested in nitrite-free and refined sugar free bacon too (I suggest you get in touch with the Paleo in Canberra Facebook page and the Crossfit gyms). lol 🙂 I’ll need to look into it all. But I’ll let you know how I go. I just wanted to let you know I’m doing a bacon making demo at the Boxgum Grazing Open Day on Sunday. You can get more informaton about the day on their website at http://www.boxgumgrazing.com.au/announcements/boxgum-grazing-farm-open-day. Check it out, I’d love to see you there! Thanks for letting me know. I’ll definitely be at the open day, and very excited about the bacon!